I love cupcakes. I love Amaretto. So Amaretto Cupcakes are simply the ultimate indulgence. It is no secret that I have a fondness for the taste of Amaretto. My go-to drink is Amaretto and Diet Coke. (Diet, because you have to watch your calories somewhere.) Basically, it tastes like a Dr. Pepper with a kick! My close friends know this about me. Heck, even the waitresses at the restaurants we frequent know this is my drink of choice. So when I celebrated my 50th birthday, it was no surprise that I received not one, not two, but six bottles of Disaronno Amaretto! What wonderful friends I have. But the ultimate surprise was when my girlfriend, Alicia, baked me Amaretto Spice Cupcakes for my birthday! Alicia is simply the most amazing cupcake maker I know. (That’s Alicia in the feature photo above.) Her creations are not only “to die for”, but are truly works of art! For me this was such a thoughtful gift because I cherish homemade gifts, I crave sweets, and I love my Amaretto! So, here is the recipe. Give it a try. I think you’ll love them too. And feel free to sip some Amaretto while you eat them! Preheat oven to 350 degrees F. In a small mixing bowl whisk together cake flour, baking powder, baking soda, ground nutmeg, ground cinnamon, ground ginger, allspice and ground cloves. Cream the butter, sugar and salt until light and fluffy with an electric mixer. Beat in the eggs, 1 at a time, beating well after each addition. Beat in the dry ingredients and the buttermilk alternately beginning and ending with the dry. Add the amaretto. When the batter is well mixed and smooth, use an ice cream scoop to divide it into paper lined cupcake tins and bake about 25 minutes or until a toothpick inserted into the center of the cakes comes out clean. Mix cream cheese, butter, and vanilla until a smooth consistency. Add powdered sugar and allspice. If the mixture is too thick, add milk until smooth. Cool cupcakes completely then pipe on the icing. Blitz walnuts & pecans in a food processor until a coarse consistency. Mix in raw brown sugar. Pour mixture onto a flat plate. Roll the sides of the cupcake icing in the sugar & nut mixture & serve. Are you a cupcake lover too? Here is another recipe we shared earlier. Printer Friendly: Kathleen’s Amaretto Birthday Cupcakes. This week we have another guest post from Chef J! I can tell you from many personal experiences that Chef J is a master at the grill! Here are simple steps for preparing a delicious smoked brisket, just in time for your Memorial Day BBQ! It’s almost Memorial Day! Hopefully that means an extra long weekend by the pool, surrounded by family and friends. And if that is the case, you will need to do some outdoor cooking! A Memorial Day BBQ is the only reason I stick around through these sweltering Sonoran summers. Phoenix in May and June will leave even the toughest crying for lemonade and air conditioning, but if you plan it right, the smell of slowly roasting meats and a nice cool pool can make this the best place in the world. One of my favorite things to BBQ is beef brisket; it’s rather inexpensive and most importantly, it’s straightforward to prepare. If you are lucky enough to have a fancy BBQ setup like I do then this will justify your dedication. My blood type is Spicy Hickory, so I love an excuse to spend an afternoon tending coals! But even if you don’t have the fancy pit you can still create some mouthwateringly tender, delicious treats! For a perfect Memorial Day BBQ brisket, the right temperature and time are most important! 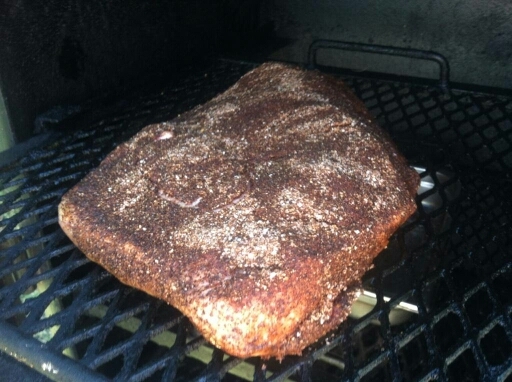 The recipe for brisket is 225 degrees for 10 hours. That’s it! Spices, sauces, and smoke are all up to your own taste. If you have ever heard BBQ people talk ,they will tell you their BBQ is the best. And they are right. It’s all about you. I like to start mine smothered in a spicy rub, uncovered in the smoker, with a pan underneath to catch the drippings. Mix everything together and rub that brisket down! Make sure that your fire is hot enough to keep the temperature around 225 degrees, and that there is a bit of smoke sneaking out. The meat will only absorb smoke for the first few hours, so after that you are strictly cooking (you could actually move it to the oven at this point). After the smoking, I mop it down with liquid about once an hour- this could be your favorite BBQ sauce, vinegar, wine, juice, beer, etc. This will help keep the meat moist but also help build a nice “bark” on the surface. After the ten hours, place the brisket in the pan that will now be full of delicious dripping and cover in foil. Let that sit for a few minutes before carving, and it will be tender, juicy and delicious. If that sounds like a lot of work, you can smoke the brisket in your backyard grill (that black, three-legged dome we all know and love) the day before for a few hours, wrap it in foil and put it in the fridge. The next day unwrap, baste in liquid, put it in a pan and cover it, roast in the oven at 225-250 for about 6 hours. If you throw it in first thing in the morning it will be ready for lunch, and you won’t have to think about it until your timer goes off. So crack open a cold one, skim the pool, and get your Memorial Day BBQ started! The school year is winding down and the kids are getting excited for summer! It’s that time of year for end of school picnics, parties, and potlucks. Kids, parents, and teachers alike will appreciate a fun day to celebrate all of the achievements of the school year! And the teachers really appreciate it if a few parents volunteer to pull a party together for them. All it takes is organization and communication. With very little effort you can avoid that party where the only food choices are pretzels, potato chips, cookies and more cookies! Get volunteers in advance to bring ice, coolers and some extra serving utensils just in case. This is a great option for full-time working parents who may not have the time to prepare a dish, but will feel uncomfortable if they aren’t able to contribute. Serve food immediately or make certain you keep it refrigerated prior to serving. Make a large cooler of Lemonade, with powder or fresh. Skip water bottles, juice boxes, and soda cans to avoid wasted drinks and excessive trash. Set up a buffet table that can be served from both sides, so you can accommodate a large number of hungry guests. Serve the kids the main meal and drinks. Get a few parents to help out. Kids will get their food and drink fast, and you will make certain that portions are controlled. Set up games to keep the kids (and adults) entertained. If you are entertaining at the local pool, this is pretty easy – all you have to do is open the gate and the kids are guaranteed a good time! If it is a backyard pool party, hire a lifeguard for the day so adults can enjoy the party too. If you are having it at a park, there are always water balloons, sprinklers, bag toss…you get the idea. Make sure you have plenty of shade and sunscreen available for adults and kids. No need to start vacation off with a sunburn! Before you let the kids leave, gather up all of the abandoned socks, shoes, shirts, towels and have them at the door and ask every kid to look to see if they are missing one of the lost items before they go! With just a little bit of planning, you can host a spectacular summer kick-off that everyone will enjoy! We would love to hear your plans for an end of school picnic – share in the comments! Looking for brunch ideas or entertaining tips, see our earlier posts. Sharing a wonderful Mother’s Day story from a very special friend, Kathy Shook. The mother of two wonderful daughters, I have enjoyed 22 delightful Mother’s Days, but one in particular will always stand out in my memory – May 10, 1992. After years of trying to get pregnant, in 1991 my husband Mark and I turned our attention to adoption. We learned everything we could about how to improve the odds of being chosen by a pregnant young woman as adoptive parents for her baby. Back then, a good number of private adoptions were arranged by “adoption attorneys.” Expecting young women sought them out to assist in finding a suitable couple. Adoption attorneys kept on file letters and photos supplied by would-be parents, and expectant girls/women would peruse them in search of top-notch candidates. So my first task was to put together a Dear Birthmom letter that was sure to stand out – well written with a nice photo. My next challenge was to compile a list of adoption attorneys from across the country. Combing through phone books from major U.S. cities on hand in the public library, I compiled a mailing list. Off went our letters to over a hundred adoption attorneys. Over the next few months we found ourselves entangled in a number of wild goose chases. The emotional highs and lows took their toll. Then we cleared the hurdle with Stephanie and her parents, but having been disappointed so many times, we didn’t get our hopes up. We received a call from Stephanie’s attorney on a Thursday advising us that she was in labor. We heard nothing more until we were awoken by a phone call Saturday morning and told to catch the first plane to this far-off city. 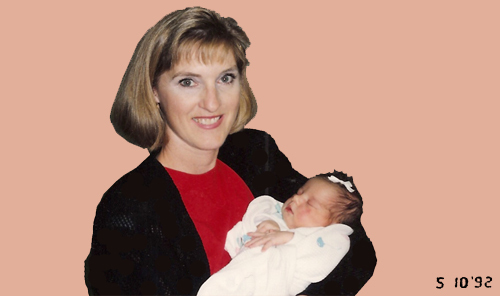 The next day our beautiful daughter Kristine, two days old, was delivered into my hands in an attorney’s office. It happened to be Mother’s Day. Most moms have time to prepare for Mother’s Day. Not me! Imagine my surprise and delight when I became a mother on the spur of the moment on the very day we honor mothers. Moms, may your Mother’s Day be as joyous as my first! We are so thrilled to introduce you to Chef J Whiting! Chef J has played an integral role in many Arizona restaurants, and travels extensively within the Southwest. 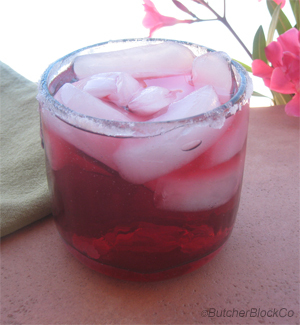 Today he enlightens us on the common misconceptions of the Cinco de Mayo holiday, and shares his fantastic recipe for Hibiscus Margaritas. We all love Cinco de Mayo – happily enjoying our margaritas, fajitas and a day off- but most of us have probably never thought much about it. Maybe like me, you had heard that it is Mexico’s independence day; something akin to the 4th of July here in the U.S. With just a bit of digging, though, I discovered the true meaning of this holiday and now have a real reason to drink margaritas this weekend. Cinco de Mayo is, in fact, not a Mexican holiday at all. The day is a celebration of the battle of Puebla in 1862 in which the outnumbered Mexican army defeated the French, throwing a wrench into Napoleon’s plans to prop up the Confederate South. Many scholars believe that the Civil War would have had a drastically different outcome if the French had not been stopped at Puebla. Hearing the news of the battle, Mexican immigrants in America began to celebrate and used that battle as a symbol to rally around. Cinco de Mayo is a holiday to celebrate Mexican heritage and culture and how it has impacted the destiny of the United States. So while you are enjoying your tequila and maybe something a little spicy, remember that without a small group of people standing their ground against the greatest military in the world at the time, the U.S. could be an entirely different place. And like any celebration, it is best with food! Cultures move a meal at a time and the American culture has been deliciously inspired by Mexico. I am lucky enough to live in the Southwest where cuisine has blurred the border. We have amazing food to explore here, and Mexican ingredients can be found all over. Do yourself a favor and make friends with a chile! Bring 1 cup of water to a simmer and add the hibiscus flowers. Let that steep for about 5 minutes or so. Add honey to hibiscus broth and stir to dissolve. Let cool. Combine honey mixture with remaining ingredients. Test for desired taste. Add more lime juice if too sweet or a bit more honey if too sour. Serve over ice in a salted or sugared glass. Repeat if necessary! Throwing a brunch has always seemed like a daunting task to me –pleasing various palates with both breakfast and lunch foods, all while making everything look a little more fancy than usual? Not exactly my idea of fun. But I’ve been thinking about brunch ideas more lately, as this beautiful spring weather beckons me outdoors and encourages casual family events. I can totally pull this off! Even if you don’t have two chef brothers (I know – I’m the luckiest gal in the world! ), the good ol’ internet is full of delicious and easy recipes (there’s one below!). Use these simple brunch ideas, and you too can pull off a great spring event that will leave everyone talking! Variety – Make sure you have options for everyone. Breakfast is pretty easy, but make sure you have some good lunch options available, too; a spiral ham on a carving board next to a cheese tray, for example, can be combined with croissants and condiments to make lovely sandwiches. You’ll also want to be aware of any vegetarians/vegans who may be attending. As much as I love bacon, it’s important not to make every dish meat-centric. A pasta salad with fresh veggies will be a crowd pleaser. As far as drinks go, though, you can keep it pretty basic – a full bar is not exactly brunch appropriate. If you do choose to serve alcohol, keep it light – mimosas or a pre made punch. You should definitely have coffee, tea, and water; throw in some lemonade or iced tea to keep things interesting, but anything beyond that is up to your personal taste. Style – You don’t need fancy china to pull off a gorgeous brunch! If I had to throw a party with all matching dishes, well… that just wouldn’t happen! You know what’s fun, though? Thrift store finds! Hit up your local thrift stores for an eclectic mix of vintage plates and serving ware – you can stick to a set color scheme or go all out and have a unique plate for every guest. You’ll make everyone feel special without breaking the bank! And if you don’t want to keep them, you can just donate them back (basically just renting dishes!). If you would rather have something more permanent, beautiful wood serving boards never go out of style, and can be used for years to come. Add a few displays of pretty spring flowers and you’ll be all set! Like your drink selection, you can take your decor as far as you’d like – just don’t clutter up your buffet table too much. Simplicity – Don’t drive yourself crazy – it’s just brunch! Even if you don’t want to cook, you can still satisfy your guests. A nice layout of pastries from your local bakery (or, you know…Costco), is perfectly acceptable when paired with a variety of fruits, cheeses, deli meats, etc. The point is to spend time with your guests, right? You don’t have to provide show-stopping delicacies to have a good time. Logistics – Hammer out those details! Make sure you have plenty of seating for all of your guests, or at least areas where they can set their plates and drinks and eat comfortably. Cafe tables are a great option if seating space is limited. Also, if you can stick with foods that are fine at room temperature, you will save yourself the hassle of hot plates and ice baths. If you are serving something that needs to stay hot or cold, make sure you have the proper equipment – you want this to be memorable, but not because of food poisoning! Now go forth and brunch! shredded lettuce, shredded cheese, chopped or sliced tomatoes, sliced avocado or guacamole, black olives. Prepare crust and put in pan or pie dish; let stand 5 to 10 minutes before baking. Bake pie shell 7 minutes; DO NOT PRICK PIE SHELL. Remove shell and reduce oven temperature to 375°. In 2 quart sauce pan combine next 8 ingredients. Cook over medium-high heat, stirring occasionally, until ground beef is browned and onions are tender. Drain mixture. Layer shredded cheese, green chiles and ground beef mixture in pie shell. In medium bowl combine eggs, half and half, salt and pepper. Beat with a fork or whisk until mixed well but not frothy. Pour egg mixture over ground beef mixture. Bake 45-50 minutes or until a knife inserted in center comes out clean. Let stand 10 minutes before serving. Garnish with remaining ingredients.